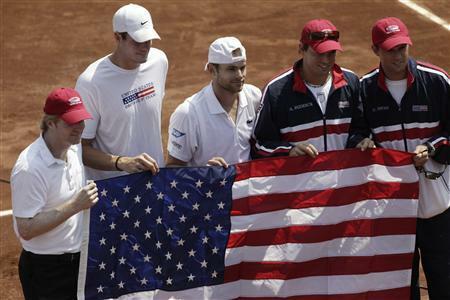 Captain Jim Courier, John Isner, Andy Roddick, and the Bryans (above, from left to right). This weekend Andy Roddick finished what he started in impressive fashion, thumping the 2004 double Olympic gold medalist Nicholas Massu on Friday, and then clinched the tie early Sunday with a come from behind four set win against world #165 Paul Capdeville on a very impressive slow red clay court in Santiago, Chile. Roddick, widely panned for his clay court prowess, was broken exactly once in each match. That’s not to say he played dominant first strike tennis. Roddick, who has grown tremendously as a player on clay and as a guy who thinks a match out–2 of his lesser abilities historically–showed off both skills on Sunday. After dropping the 1st set to Capdeville on grotesque and horribly slow red clay that groundskeepers watered on changeovers, Justin Gimelstob, who The Tennis Channel was too cheap to send to Santiago, said from an LA studio (so low grade!) that Roddick had let his opponent grow too comfortable and would have to change his tactics. Such a pronouncement 3 or 4 years ago would not have sat too well with the close Roddick observer. First time captain Jim Courier did not bat an eyelash. In fact, the proven winner and distinguished major champion, showed nothing but calm the entire weekend, even when Roddick’s opponent Capdeville, in his match Friday versus Isner, seemed to at worst cheat and at best display questionable sportsmanship at a critical stage of the fifth set on a break point which he lost. Isner hit a winner from the back of the court which Capdeville did not play, claiming he heard an out call. Right. We were extremely annoyed. It was a classless move on the part of the Chilean, an obvious ploy that we’ve seen tried on occasion by the desperate, but which we can’t really recall a big league chair buying. Enter Friday’s clown show. The chair called the ball a let, and Isner who couldn’t buy a break point all match, literally, until that point, didn’t get another. Gimelstob once again provided the dead on commentary, reading our minds by taking the poor returning Isner to task. G-Stob called Isner’s return game a glaring weakness, noting that the big man could not cry about calls when he generated so few opportunities for himself. About 1 game letter, Isner began to cramp, and once his legs had tightened up, he was basically done, but he did manage 4 holds in the decisive 5th set, and with the stolen break, would’ve won the match. In fairness to Isner, the kid shows tremendous promise, has steadily improved since taking the tour by storm out of the NCAA’s, and is the American who most deserves the Davis Cup Singles B role. Unlike Sam Querrey, Isner shows excellent killer instinct, a volleyer’s touch, and doesn’t shrink from big moments. Isner has had several breakthrough wins while Samurai Sam has yet to notch any of note, especially at the majors. America’s only other option, world #15 Mardy Fish, is also someone we aren’t comfortable seeing in James Blake’s B role. Fish is a very bad big match player. If he was ever going to beat a Chilean in the big spot, it would have been at the 2004 Olympics where Massu bested a then chubby Mardy for the gold. We don’t put a lot of stock in Olympic tennis for the sake of its actual tennis importance, but as an American sports fan, we don’t give Fish the option to lose to a Nicholas Massu with gold on the line. Back to Roddick, who stayed level throughout a tense second set that really was a must win for both guys. Roddick blew a late break chance, shook that off, went into the breaker and then blitzed Capdeville, getting out to a 5-0 lead which carried him to the set win. It was all down hill from there. Roddick dominated the last two sets in uncharacteristic fashion. He had managed only one ace through 3 sets. Roddick, who tends to play a passive style too much these days, was on the ‘perfect’ surface for it. He gave up the net and counter punched to perfection, hitting more winners off of his usually defective backhand wing in one match than we can otherwise recollect. Roddick has long been due a re-appraisal by the stubborn Andy-can’t-play-on-clay faction. He’s come through plenty of times for America on the dirt, and more times than any other American in the storied history of Davis Cup, now having clinched 12 ties (5 on the road). And Roddick has played several fine matches at Roland Garros in the last 2 years, making the round of 16 in ’09, which is something many doubted he’d ever do. In our opinion, Roddick might be the best player of all time who has only won 1 major, and had a guy named Roger Federer never came around, Andy would probably have several major titles. Losing 4 major finals to Roger Federer is nothing to be embarrassed about. Roddick is one of few guys to ever have been #1, to have won a major, a Davis Cup title, and to have been in the top 5 for 5 consecutive years. And unlike Roger, Roddick always seems to turn out for country. You all know of our devotion to Federer, but you should also know we try to tell it as we see it. It doesn’t sit well with us that Federer abandoned his country’s Davis Cup squad. We know his arguments, and we understand them. He needs to pick and choose, he can’t risk too much exposure in a non major setting…we get it. But Nadal can? A frequently hobbled Nadal usually doesn’t duck Davis Cup, and to his credit, he has a championship to show for it, as does Roddick. 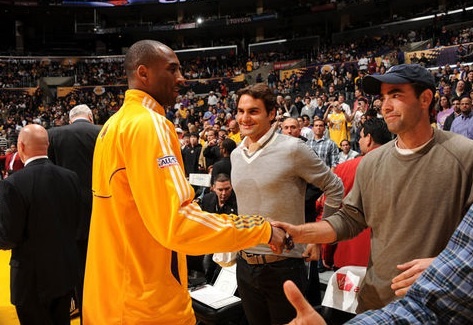 Federer doesn’t take Davis Cup calls from Severin Luthi, one of his own coaches, and while the rest of the men’s tennis world is sliding around on disgusting mud courts, Federer is hob nobbing with Pete Sampras and Kobe Bryant in Los Angeles (below). Again, we get it. Federer is the all time mens singles major champion with the Swiss flag behind him, so what does it matter that he doesn’t have a DC title? A tennis purist would say it does matter some. There is no definitive greatest player of all time, and everyone from Borg to McEnroe, Sampras, and Nadal have won the DC, and in most cases, had at least one title they were the impetus behind. The only greats we can think of that have not won the Davis Cup are the ultra selfish and loutish Jimmy Connors, and Federer. Perhaps Federer, like Connors did, will feel the hole in his immortal resume, and come back to Davis Cup in his twilight years. And unlike Connors, Federer is great enough to pull off such a thing and win a late DC title, maybe even into his early 30’s. Maybe Federer has lost a bit of his ‘major edge’ because he isn’t as tested in Davis Cup lately and in the best of 5 set format as the last 3 guys who have beaten him at majors, Soderling, Berdych, and Djokovic. As for the other Jimbo, our new skip, Jim Courier, we are ecstatic to have him (especially over the hack that is Todd Martin), and he must be ecstatic that Roddick takes his calls. Let’s face it. Courier is a winner. He’s been there and done that. Chile in a mud storm in front of the worst tennis fans this side of France while getting potentially tie deciding bad calls does not phase him in the least. Not only does Courier play the same style, more or less, as the top American singles players, but he was a better player than all of these guys, and has greater insights about top tier tennis than the former DC coach, Patrick McEnroe, who had less talent than Courier, less desire, a lesser work ethic, less athletic ability, and we think, a lesser mind for the game in general. We think it’s not a coincidence that the national junior program is foundering with PMac at the helm. Next up for the US squad will be Spain in the quarters, about one week after Wimbledon concludes. Before anyone gets around to anointing Spain, let’s all keep squarely in mind that home countries have an enormous advantage in Davis Cup. In Courier’s first home tie as captain, he will decide the venue and the surface which as yet, is unannounced. The surface is sure to be a fast hardcourt, and though there might be attendance concerns, in a play from the British play book, we think it would be very wise to consider Flushing Meadows for the tie, the way that Britain tries to play their ties on Wimbledon’s centre court. America always chooses hards, and for a few years now, have only had the pick off-season, choosing slick indoor surfaces in Baltimore, Birmingham, and Austin. You can’t really play this thing indoors in July. Should the Americans opt for a more intimate setting, we think Cincinnati would be perfect. The Cincinnati Masters Series has long been considered the fastest outdoor tournament in the world. We can think of no recent Spaniard who’s had any success there. Also, we love the dynamic created by forcing the Spaniards to play on fast hards in the shadow of Wimbledon, especially if Nadal goes deep at SW-19. In fact, we can hear Nadal crying about the turn around and surface switch from here. Don’t be surprised if he asks out. If he doesn’t, we look forward to seeing him finally clash with Roddick on a fast hardcourt, and we like our other guys as well versus the Spaniards on the hards with stars and stripes flying.